Clean AMHS | Products | MURATEC,MURATA MACHINERY, LTD.
Clean Technology assures Advanced Electronics. Only half a century has passed since the transistor was first invented in 1947 by AT&T's Bell Labs in USA, the semiconductor has come to be called the "crude oil of industry" today, semiconductors products, propelled by technical advancements in electronics and multimedia, have found uses in various area of society and are essential to our daily life. Semiconductors are produced in precisely controlled clean rooms. Material handling systems inside clean rooms must not only be completely contamination-free, but also provide absolute reliability in the highly automated production process. 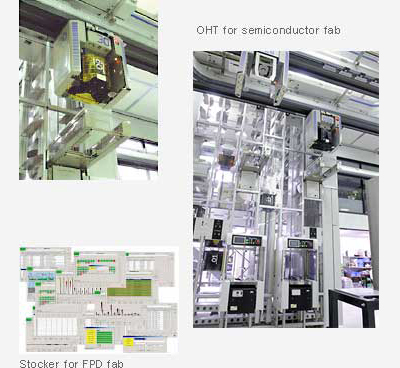 Muratec, using its many years of experience and know-how in material handling technology, has long helped semiconductor manufacturers increase their productivity by supplying them with various transport and storage systems. Muratec will continue to be a major player in the multimedia world by enhancing semiconductor product and reliability under the clean systems process.